All orders, pre-invoices, and invoices have default numbering. You can edit numbering based on your needs in section Settings / Orders / Numbering. Click on the button CHANGE NUMBERING. Counter- displayed number shows from which number the counting will start or where it has started before. If you want to edit already set up the field, you have to click on it. It is possible to rewrite it manually or edit with a tool panel placed on the bottom. magnifier - preview numbering already created items. Here you can change initial value, size number ( number of digits in the cell ) and type counter (by menu selection, choose an increase in the number based on your needs). Choose the unit of the time- year, month or day. Choose how many digits from the chosen unit of time will be shown in the numbering. 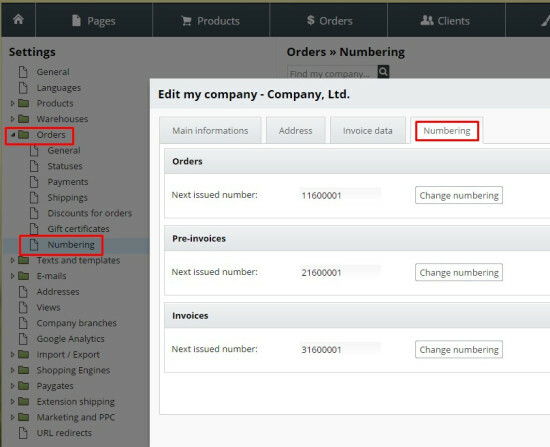 You can set the number of orders consistent with invoice numbers, pay attention here. The numbers can be diverse later on. It depends on whether you create invoices from orders or when do you receive money to your account. If you have multiple company branches of administration, orders / invoices numbering is independent of each branch. Edit Numbering for company branches in section SETTINGS / COMPANY BRANCHES. Open the detail tab of the company branch and follow tab Numbering. What is going to be as a variable symbol for pre-invoice and invoice? Variable symbol matches with pre-invoice or invoice numbering. Depends on we use pre-invoice or not. More info about variable symbol usage read below. How do I set up orders numbering after the new year, to begin with number 1 again? 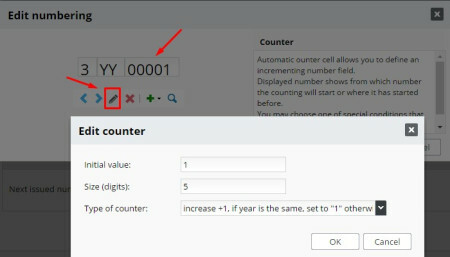 In Settings / Orders / Numbering edit a counter cell: increase +1, if the year is the same, set to "1" otherwise. It is ideal to add Date cell - YEAR (YY) to numbering. Otherwise, you have got the same numbers for invoices and orders as a previous year. The variable symbol is not connected to orders numbering. Order numbers and invoices can be constantly different. Why so? You won´t create for all orders the same invoices (because of order cancellation).If we want variable symbols to follow each other, we set up a numbering according to pre-invoice / invoice data. 1. If you use pre-invoice and invoice. The variable symbol is the same as the number of the invoice. How to edit VS? In Settings / Orders / Numbering set up the pre-invoice numbering. Check out the number of the last pre-invoice. In our case, it is a number 25, and after that, you just change the settings for pre-invoice numbering on 26. 2. If you do not use pre-invoices. The variable symbol is the same as the number of real invoices. How to edit VS? Just change next invoice numbering in settings. You can change also numbering for next order, but that´s very tough to follow because some of the orders are cancelled without invoices. More comfortable is just to edit invoice numbering.